How to lay ceramic tiles? A practical overview of the possible combination of tiles. The decision on how to lay ceramic tiles is sometimes as important as choosing their particular pattern since the method of laying them does affect the style and aesthetics of the interior. While the arrangement of “ordinary”, exclusively square tiles of the same size usually does not give rise to many challenges, collections of various formats or non-standard shapes open a real wealth of possibilities before the brave interior designer. 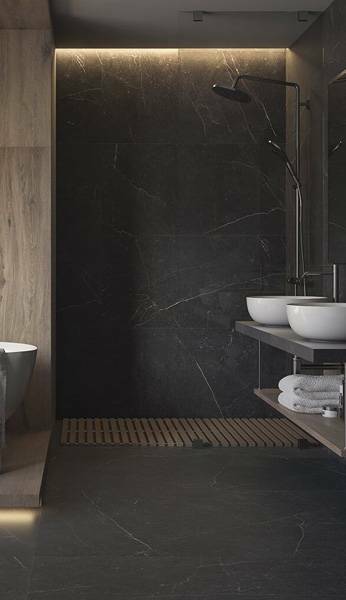 Today we will look at interesting combinations of tiles which create a space full of character. Squares and rectangles – the most basic shapes for wall and floor ceramics. They retain their timelessness and are still eagerly chosen. Laying them does not have to be boring at all – by combining them in a varied way we can achieve intriguing effects in the interiors. The most typical shape and the easiest way of the “grout in grout” laying can be more attractive than some complicated sequences. 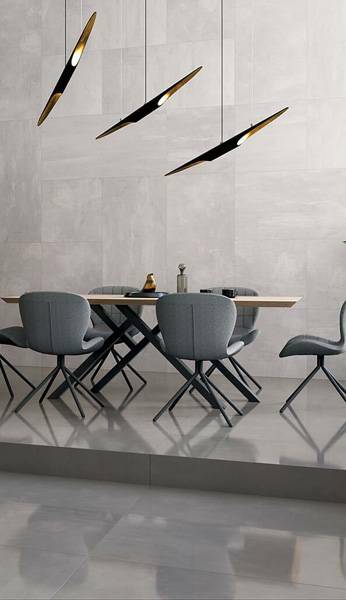 Rectified edges of the tiles from Naturstone collection make the minimum joint between the tiles almost invisible and the whole creates a uniform surface. Square, large tiles of Menfi collection laid along the line on the floor and alternately on the wall bring dynamics to the interior. Small square tiles, decorated with few decors, and the arrangement at 45-degree angle in places – this is an offer for avid traditionalists and lovers of rustic style. Polished squares and rectangles laid alternately will surely enliven any space. Mixing colours and formats – in this way you can design countless compositions. One shape, two colours, lace ornaments, and a combination based on the horizontal-vertical game – create an fascinating decorative effect. Ceramic tiles with the appearance of wooden boards can be laid in a variety of ways, giving the space a modern or classic dimension. Apart from the still successful parallel systems, a brick or the so-called English pattern , the classic parquet arrangements are again very fashionable, e.g. herringbone, chess board, ladder or patterns with a cube. Wood-imitating tiles from Thorno collection also allow to enrich the quiet floor by using tiles in two widths. The so-called double herringbone is also an excellent choice for interiors maintained in a traditional style. Wood-imitating tiles do not have to reign solely on the floor. If we put them in an innovative way on the wall, we can obtain a staggering, spatial 3D effect. The ceramic tiles allow for designing the expressive, mesmerizing systems, reminiscent of, for example, fashionable carpets. Such compositions work perfectly well in places with a clearly defined layout of functions in the room. The bright background of large-format tiles impressively exposes the “carpet” made up of large graphite squares and smaller decors. The large-format tiles with a marble look from Crema Marfil collection shine even more sharply in the setting of Rovere wood-imitating tiles. And now – in contrast with the floor examples, interesting geometry on the wall . 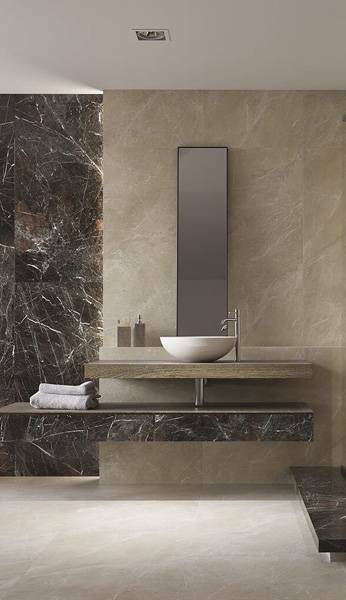 The consistently “random” combination of four tile colours, arranged alternately both vertically and horizontally, creates a stunning effect. The homogeneous floor made of graphite squares emphasises the “wall madness” of large-format geometry. If we settle on the uniform appearance of tiles, both on the wall and on the floor, we are not necessarily threatened with monotony . When we combine different tile formats – for instance, very large squares and smaller rectangles on the floor, and decorate the wall with a cut mosaic – we obtain a fresh, dynamic expression of the entire interior. Diversified arrangement of tiles in several formats on the floor and wall dynamises the calmness of stone graphics. The subdued, classic interior pulsates thanks to this vivid energy. The perfect shape of a honeycomb occurring in nature can be easily transferred to our own space. Clinker collections based on hexagons are enriched with trapezoids, diamonds, and half-diamonds which allow for interesting arrangement fun and even the creation of optical illusions. The basic arrangement of hexagonal tiles next to each other is very effective in itself. If we add to this the darker colouring of fragments of some tiles and put them in a random way with the unicoloured ones, we can deepen the clarity of the arrangement. Skilfully juxtaposed hexagons and diamonds evoke hypnotising 3D optical illusions. For those open to a diversity of investors, special options are also available, allowing smooth transitions from the wall to the floor, as well as creative games with shape, pattern, and colour. Such combinations require courage which is then rewarded with the delight of guests and the sense of perfect shaping of their own space. Rectangles, hexagons, triangles, and grains of wood – together they form a coherent composition. Nothing stands in the way to combine a wood-imitating floor with the large-format ceramic tiles of the concrete look and geometric hexagonal tiles in one interior. The final arrangement effect can be consistent and at par with the latest trends. The fashionable bathroom combines contrasting shapes, formats, and textures. Stairs are a primarily functional element. They must be comfortable, safe, and they should fit the rest of the space. The stairs, therefore, require special attention in order to skilfully combine security for users, while at the same time maintaining the standard of the arrangement of a given place. Well-arranged stairs are not just an anti-slip surface. 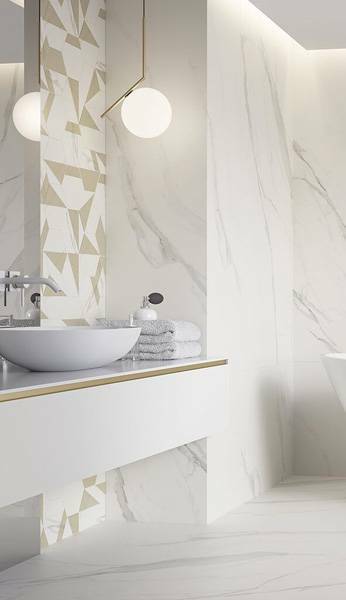 It is also the attention to detail, such as finishing the corners or skirting boards (in the picture –clinker tiles from the Taurus collection). Even the most basic tile shapes can conjure up beautiful interiors. It is worth attempting some arrangements with contrasting sets of shapes and colours. Bold designers and investors can “splurge” with expressive forms of ceramic paintings and rugs. In case of wood-imitating collections, there is a huge arrangement potential which allows to achieve a variety of interior styles resulting from the way of arranging the ceramic “boards”. Trendy hexagons are still open for interesting arrangement experiments. Stairs can be a beautiful complement to the space when we take care of both their practical and aesthetic values. Rynek płytek ceramicznych, zarówno polski, jak i zagraniczny nie ma dla niej tajemnic. Jest zawsze na bieżąco ze wszystkimi nowościami (branżowymi, technologicznymi i produktowymi). The hotel interior – what to remember when choosing a ceramic material? White tiles do not have to be boring! What to combine them with? Discover several ways for white interiors! How to visually enlarge the space in a small bathroom in the hotel? We suggest how to do it! Kitchen island – 7 inspiring arrangements!